The soundtrack for independent “video nasty” THE STREET RUNS RED is being released by Spun Out Of Control, a tape label that’s better known for working closely with composer Wojciech Golczewski having issued both DARK SOULS and 400 DAYS. The movie is now on a festival run and it was done by Ungovernable Films, an indie movie studio that has done a couple infamous features, HONKY HOLOCAUST and GAY JESUS. This new movie was done with the help of an Indiegogo campaign with the goal to make a serial killer film that raises the bar on gore and offensiveness. The film follows an aging detective and his hotheaded partner as they’re pursuing a serial killer that somehow lands right under their noses, without them realizing it. It’s done with close to no cash at all (their online campaign collected a bit above $4,000 dollars) and, if the trailer is to be believed, it sports a creepy dirt-cheap VHS feel that feels right at home with their endeavor. The soundtrack if a very effective piece of work by Timothy Fife and Dave Ellesmere. Fife has some fame as a Death Waltz Originals artist, his EP BLACK CARBON came out earlier this year. Ellesmere used to play drums for Discharge and Doctor & The Crippens, and has a solo career as an electronic musician and seems to have found a partner in crime in Fife. 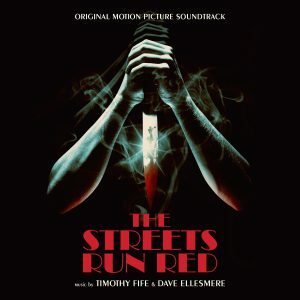 As with a lot of the more recent electronic horror soundtracks, THE STREETS RUN RED is a bit indebted to John Carpenter, yet original enough to be totally worth seeking out. There’s a jazzy number that is the soundtrack at its most tense, and the main theme is just plain amazing as are the closing titles. The artwork for the tape was done by Eric Adrian Lee (Mondo, Death Waltz, and Giallo Disco) and it comes in either blood red or black cassette shell. It ships out on December 7th. There’s also a digital release, so you can get it anytime, really.